Down Syndrome Awareness Sterling Silver and Swarovski Crystal Awareness Bracelet. 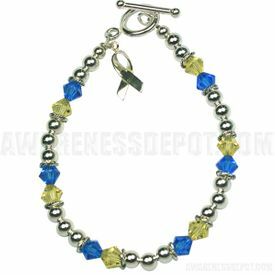 This Awareness bracelet is accented with sterling Bali beads, and ended with a beautiful sterling silver Down Syndrome Awareness charm. This beautiful Down Syndrome bracelet is entirely made of sterling silver and Swarovski crystal. The yellow and blue color symbolizes Down Syndrome Awareness. This is a beautiful way to show support for someone with Down Syndrome Awareness. Makes a great gift. Make sure to see our full selection of Down Syndrome Awareness products for more great ideas and gifts.